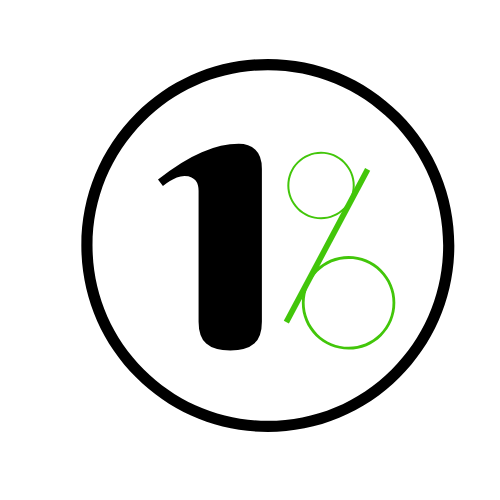 One Percent Greener is a blog about baby steps. Inspired by the concept of marginal gains, I created OPG to talk about the little things that everyone can do to reduce their impact on the environment day-to-day. Sometimes it can feel like going green is an impossible feat – the big things can be so out of reach, and even knowing which kind of reusable shopping bag is best can feel daunting. Going green doesn’t mean you have to overhaul your entire life, and it certainly shouldn’t require you to pay a huge amount. The more doable something is, the more people will do it, so I’m trying to make ‘eco-friendly’ as easy and doable as possible. Whether it’s Meat Free Monday, choosing loose produce at the store, or investing in a reusable take-away coffee cup, (or even all three!) every little change is valuable. It’s important to acknowledge your limitations (be they financial, infrastructural, dietary, or physical) and work to the best of your ability within them. Never let anyone tell you that you aren’t doing enough, as long as you are doing as much as you can. OPG values realism. It’s important to remember that you can can never have no impact on the environment. You could kill yourself worrying about every scrap of plastic and every drop of water, especially if you don’t have direct control over them. As a woman and a South African, naturally my posts will tend to focus on topics related to those things slightly more, but overall I’d like OPG to be as broadly relevant and inclusive as possible. There is extra pressure on women to make eco-friendly lifestyle choices. We have all these extra things in our life, like pads and tampons, makeup, birth control pills and hormone supplements, and all of them place strain on the environment in different ways. While some are unavoidable, it means there we have added responsibility to make changes where we can, like what brand of makeup we buy. What’s so special about being South African? Being eco-friendly is easier in some places than others. In Japan, recycling is a legal obligation, Iceland generates 100% of its electricity through renewable sources, Finland has some of the best public transport in the world. I read dozens of articles and posts from countries like the US and UK and Australia, which have wonderful and innovative ideas for living a more eco-friendly life. But sometimes the things they talk about don’t even exist in South Africa yet. Something you don’t see a lot of, is how to be more eco-friendly in a country that lacks infrastructure to support you. Sadly, environmentalism is still something of a luxury mindset. Living in a country where unemployment is at 53% and only 66% of people have access to sanitation, often environmental issues, like recycling and animal rights, can fall by the wayside. I don’t like or agree with this, but I do understand that if a government has to make choice, ultimately they are ‘for the people, of the people, by the people’ and they will choose to help the people first. I’m not even going to go into the corruption that has cost the country billions of rands in taxes. As a born and bred South African, I love this country and I think it has amazing potential, but I think that potential lies in the private sphere: small businesses and entrepreneurs, private homes, schools and churches, among others. And this blog is part of my contribution to that future potential. As I said before, I’m a born and bred South African. I’ve lived most of my life in KwaZulu-Natal, but I hate the beach! I’ve always been a mountain lover and a keen, but not very good birder. I studied environmental science and water resource management at Rhodes University in the Eastern Cape, and then went overseas to teach English in Taiwan for two years. The decision to start making my life greener is a fairly recent one. It started with switching to a plant-based diet and recycling, then buying cruelty free skin care products (as much as I can), and now I’m on a voyage of discovery, learning new things every day and trying wherever possible to make the best decision I can. And sharing my discoveries with you of course! I don’t align myself to any particular organisation, and none of my work is sponsored, funded or in any way influenced by any third party (unless I explicitly state otherwise in a post). It’s just me. But I can guarantee that I will never post anything I have not researched, and I will always provide you with links to check things out for yourself. However, this means that I won’t have all the answers, so I am always open to suggestions, advice and comments, but I reserve the right to ignore you, block you and delete your comments if you are in any way rude, demeaning, bigoted, insulting or hurtful to me or any of my other readers. We can only change the world if we work together, and there is no place for segregation in saving the planet. Let’s be honest, haven’t we had enough of that already?